There’s a lot of talk about how brands are seeing a drop in Organic Reach right now of their content. I’m here to tell you that it’s not the end of the world. Of course, I care much more about desired actions with my content (shares, link clicks, conversions). But you’re sophisticated enough to know you should look beyond Reach and to those important metrics. So I’m going to assume if you’re reading this, your desired actions are down as well. Now, I’m going to get into this topic of Reach even more on a later day. But the fact of the matter is pretty simple: Even if your Reach is down, you’re still reaching the people who care most about your content. You just might not be reaching the people who don’t engage very often with you as much as you once did. This is important to remember because if you listen to those protesting the loudest, you’d think that you can’t reach anyone who cares about your content anymore without paying for ads. While ads should always be part of your strategy, this claim simply isn’t true. Evidence of this was found in my News Feed experiment that showed I saw over 100 organic brand stories in my News Feed (28.4%) covering a 24-hour period. And some brands like Mashable and TechCrunch were represented 15 times or more each. So some brands still rock it. And you certainly can, too. If you’re going to publish something, make sure it’s during a time when as many of your Fans are online as possible. Particularly if you don’t post many times per day. This may seem obvious, but you may be doing more to hurt your Reach than you know, simply by posting at the wrong times. Luckily for you, Facebook helps you correct this. 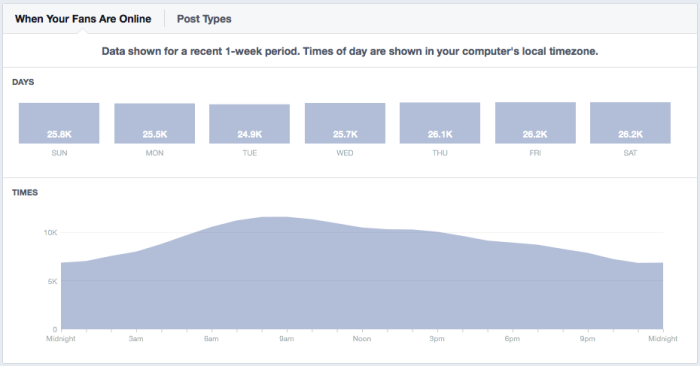 Within your web version of Insights, there’s a handy graph called When Your Fans Are Online. This charts when your Fans saw content from anybody — not just you. This is found within the Posts section. For more details on how to find it, make sure you read my tutorial regarding the new web Insights. What’s great about this is that it tells you when your Fans are online by hour — in general or on specific days of the week. For me, my best times are between 8-10am my time. So while I do post multiple times per day, I do my best to publish my latest blog post — my most important post of the day — during this time. Want to reach the most people with your most important content? Make sure you know when your Fans are online! Opinions on this one have evolved over time. It was once believed that you should limit your publishing to avoid annoying your Fans. Some said as little as once per day or only a handful of times per week. Ya know what I say? Bull to that. A little more than half of your Fans will be on Facebook every day. Of that number, they’ll be on for an average of 30-60 minutes. If you don’t post, you obviously don’t reach anyone. If you post once, you can only reasonably expect to reach Fans who were on within about a one to two hour window. To improve your odds of reaching more people when they are online, you need to post multiple times per day. How many times that is will be dependent on the content you have as well as the preferences of your audience. Don’t repost the same thing multiple times in the same day. And don’t post for the sake of posting. If quality goes down, your Fans will tune out. If you can maintain a high level of content, feel free to publish… almost as frequently as you want. However, I’d recommend keeping at least a buffer of one hour between posts. Personally, I try to keep posts separated by at least four hours. I then shoot for four to five posts per day. I’ll even schedule a post for the middle of the night when I’m sleeping (more on that in the next step). Let’s provide some statistics to support why you need to post more frequently, shall we? This is what I strive for on a typical day in terms of frequency and distribution of my posts. It just isn’t always possible. The Reach I got wasn’t particularly spectacular for a Page with somewhere around 25,000 Fans at the time. But the key here is that I published at five different times, all separated by around three or four hours. So I reached different audiences throughout the day. Total Organic Reach for that day: 6,709. Imagine if I had only posted at 12:30 that day, reaching a number that is only 8.6% of my total Fan base (keep in mind that Organic Reach includes non-Fans, though)? That’s a pretty dreadful day. But since I posted five times on that day, I ended up organically reaching 6,709 people, or 26.8% of my total Fan base. Now that is a number most brands could get behind! Want to reach more people? Post multiple times throughout the day, strategically buffering time between posts! One way I’m able to post multiple times per day is by scheduling old, evergreen content — this is the post I set aside late at night, often when I’m sleeping. Every couple of months, I’ll update my list of old content that is popular and still has value. 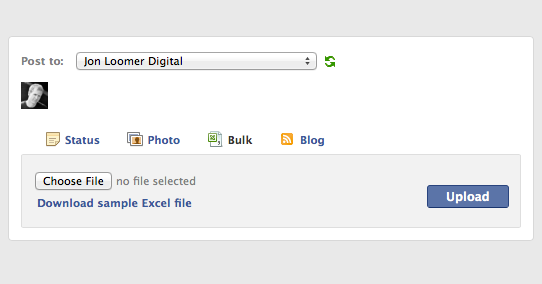 I’ll then create a spreadsheet with a fresh new spin on that post for publishing to Facebook. I pick a different time each night from 10pm to 2am, moving up 10 minutes each night. I then upload this spreadsheet into PostPlanner. You don’t have to use PostPlanner to schedule your content, but since I typically have 50-70 posts to schedule, I find their bulk post uploader to be extremely helpful. I pick this time at night because it’s unlikely to be a time when I would otherwise be posting. Once again, I’m trying to avoid posting back-to-back without at least a couple of hours in between (that’s just me, but pick a buffer that works for you). I also publish late at night because it makes it more likely I’ll reach a new audience. The first time I would have shared that post, it would have been between 8am and 10am. Not only will my Fan base evolve in between, but I should reach a completely different audience based on the time zones that are awake during that time. I’ve found this to be extremely effective in terms of reviving my older content. Consistently, I’ll get a couple hundred link clicks from one of these late night shares. That type of traffic adds up! Want to reach more people? Schedule older, evergreen content during times when you’d normally be sleeping to reach a different audience! When I ran my News Feed experiment, I found that I saw 106 organic stories from 38 unique brands. I don’t know how many stories I didn’t see, but I can tell you that those 38 brands absolutely produce some of my favorite content. And Facebook knows this. Whether I click “like,” comment, share, click a link, click a photo, or click to view comments. Facebook sees that I’m engaged. And since I rarely comment, like or share, these “invisible” clicks are critical. Facebook tracks them, and they are still able to accurately fill my News Feed with content I care about. Facebook is not a billboard. It’s a social network. And as such, Facebook wants to encourage social activity. If you aren’t being social with a person or brand, they are less likely to share their content with you. Of course they won’t click on every single post. That’s ridiculous. Stop worrying about it on such a micro level. Of course, you can’t use old, played out calls to action. Be creative. 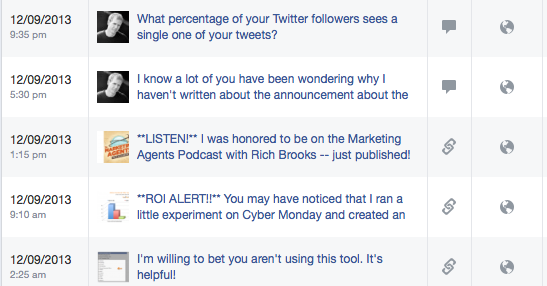 But no “click like if…” or “comment if…” or “share if…” types of calls to action. 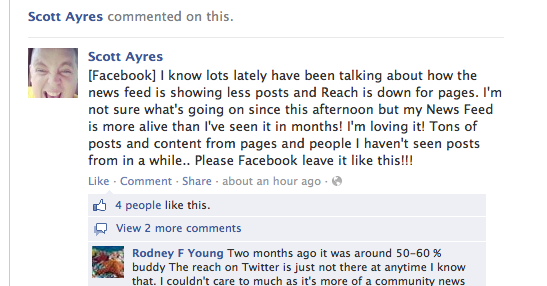 Facebook has hinted that this type of stuff will be punished (and you can bet it gets negative feedback). Want to reach more people? Produce content that people actually want to see and engage with! Not sure what I’m talking about? It was announced back in August as a way to resurface slightly older content that is getting a lot of engagement. I know that I see a ton of this from my friends these days. They comment on an old photo (sometimes really old), and it’s at the top of my News Feed. Now imagine that my friend is commenting on an old post from a brand Page? Now, it’s not clear exactly when this happens. But it’s likely that it needs to be a friend commenting on a post by a Page that you like. So it may not happen frequently, but there are absolutely benefits for you if you can create content that people will comment on. This is a big deal because I know there are a ton of brands in the business of creating memes to get likes. You know what? That won’t help you. You’re going to need comments. In addition to Story Bumping is a closely connected feature called Last Actor. 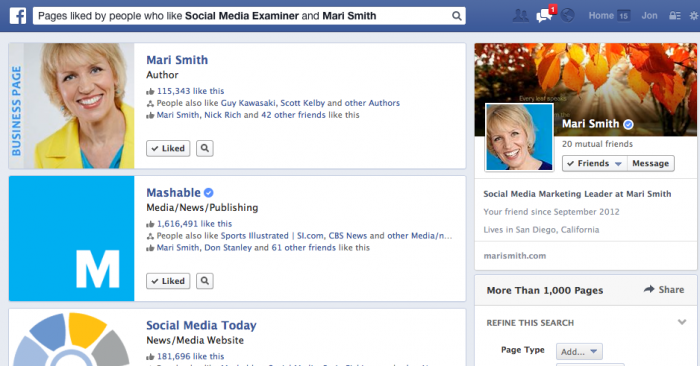 Because of Last Actor, Facebook favors any person or Page you interacted with during your last 50 interactions. That’s tying everything together now, isn’t it? This is a good reason not only to create highly engaging content, but to publish often! Want to reach more people? Craft content that inspires a comment so that you can benefit from Story Bumping! 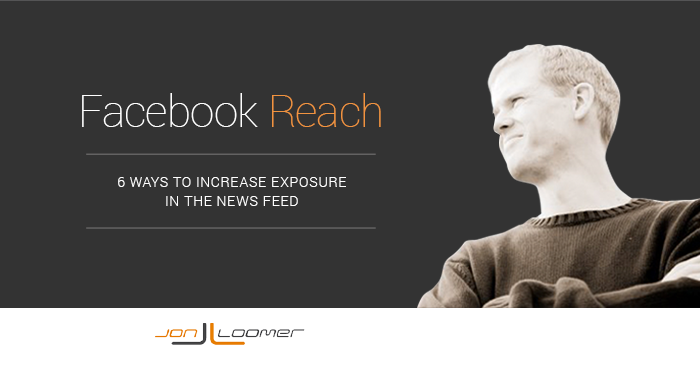 Want to screw your Reach? Buy Fans. Or build your audience with poorly targeted ads. Or run contests to build your audience that give away prizes that aren’t related at all to your brand. First of all, build your audience organically by doing all of the things mentioned in 1-5. If you create a lot of high quality content, consistently and frequently, it will end up reaching non-Fans. And you’ll get a ton of Likes that way. Second, you have to be careful about your ad targeting. Don’t focus on the cheapest price possible. Focus on the relevant countries, and avoid those countries that you see result in spam on your posts. This may mean spending more. It will mean that. But it’s worth it. This is how you build your audience the right way. If you do, you’re much more likely to have Fans who actually want to see your content when you publish it. Want to reach more people? Build a relevant audience of Fans who actually want to see your content!